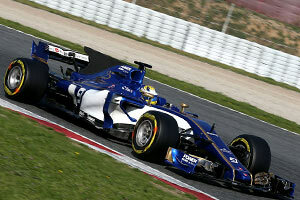 The C36 is Sauber's 25th car in Formula One, hence the team chose to colour it in a celebration livery with blue and gold. The car was unveiled online on 20 February, a week ahead of the start of pre-season testing at Circuit de Catalunya where it made its track debut. Despite the looks of the highly developed and unique airbox solution - also see the technical analysis of the car -, the C36 was the result of a very limited development track, as the team were very cash strapped in the first half of the 2016 season until they managed to sign a new investor. This, along with the team's limited staff compared to the big teams meant development was less intense. It also triggered the team to choose to use 2016 Ferrari power units, instead of opting for the up-to-date Ferrari type 62. While knowing it would put them at a considerable disadvantage, especially without upgrades throughout the season, the team preferred to use the older units, avoiding the work that would otherwise be needed to fit modified power unit ancillaries. The reduced development also triggered Team Principal Monisha Kaltenborn to say the team were aiming to make strides throughout the season: "we have a solid basis as well as the resources to further develop the Sauber C36-Ferrari through the season. This will be important to establish in mid-field." Pre-season winter testing immediately confirmed the team's fears, with Sauber's drivers usually ranking among the slowest of all during most of the 8 days of testing. The team's fastest lap was 3 seconds slower than the quickest - Ferrari. The car did however run reliably, with 788 laps completed, the fourth most of all teams.